Have you ever wondered what “photopass” was? Well I am here to explain to you the power of the pass and all the benefits of purchasing one before you leave for your Disney Vacation! For many years Disney has offered something called “photopass”. This is a special service offered by Disney to those who visit the Walt Disney World Resort. If you book a WDW vacation package you will be given the option to purchase the photopass online before you leave for your vacation. By pre-purchasing the pass you will save a considerable amount of money. This pass is a special card you will use any time you see a Disney photographer throughout all the parks. With the addition of the photopass plus in recent months, it is an especially great value for your money. The photopass card allows you to get as many pictures by photopass photographers as you can manage to get your family to stop and take. However, all ride photos, special dinner photos, and the like were an extra purchase. The new photo pass plus solved all that and makes it a really great purchase. The photopass plus if purchased at least two weeks before you leave will save you $50.00. It will include all the photos from photographers throughout the parks, but also includes your ride photos, dinner photos, and special event photos such as make overs at Bibbidi Bobbidi Boutique or the Pirates League. The trick to getting as many pics as possible is to understand how the photopass system works. This is especially important if you are traveling in a large group or family. 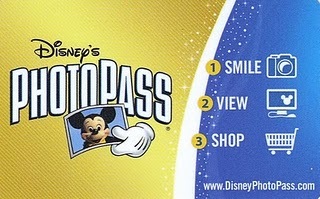 After purchasing your photopass plus you will receive a package that contains a coupon/voucher and CD. The voucher must be taken with you when you leave for your trip, so as soon as it arrives, tuck it away in the luggage where you are keeping your other important travel documents so you do not forget it. When you arrive on your first day and go to your first park, go to the photopass location right inside the park and present your voucher. At that time you will be given a lanyard with the photopass plus card on it. Take a picture of the numbers on the back with your smart phone right away. If lost, this is how they will be able to issue you a new one and will also be important when you get home to redeem for all your pics. Instruct everyone in your group when they are not with the person holding the lanyard to stop at every photographer they can to get their picture taken and get their own card from the person taking it. Make sure they keep up with the cards and that they know all their pictures can be added to the same card they got from the first photographer. Hint: (have them take pic of each card they get in case they lose it) Even when you are not together everyone can get pictures made which you will add to main photo pass account once you get home. The ride pics are a little trickier! If the person with the main lanyard is not with you, be sure to have them go to kiosk at the end of the ride and get the person to pull up their picture. If it is a good one that they want to purchase, have them write the number down. Anytime during that day the person with the lanyard can go to the ride photo kiosk and have it added to the lanyard. Major tip: when going to special dinners, such as 1900 Park Fare with Cinderella, or any other dinner where there may be special photos taken; do not leave your lanyard back at the hotel!!! As you may have guessed I have made that mistake. Even with the picture of the pass they will not add them to your lanyard. It is possible to get them added later, but a real hassle. OK, so now you are home and you have your lanyard and multiple photos pass cards that people in your group had pictures added to. What next? You will go online to Disney photopass website and create an account. There you will be able to add your main lanyard numbers and add all the photo pass cards you have to the same account. After editing, adding special effects, and other things you will want to do to all your pics you will have the opportunity to order other products or simply order the CD you had purchased in advance. It will allow you to upload 160 of your own photos from your trip, but if you are not creating a book or other items, this is not really necessary. I have created books and photo mugs and many other things, but if you just want to order the CD that is great too. Your purchase price includes that CD and will be well worth the money! After you add your CD to your shopping cart you will then need the CD that came with your voucher before you left on your trip. In this CD there are many great extra shots of the parks and all the characters, but most important in this CD is the code to cover the cost for your purchase of one CD that will include the license release to have them reproduced. You can also purchase additional copies for a very reasonable price. I have to say that the original photopass purchase was nice, but I always wanted to purchase ride shots and special event/dinner shots and this could become very costly. The new photo pass plus is an extraordinary deal and well worth the price!